When the full moon shines, a paralysing fear descends on the isolated Maine town of Tarker Mills. No one knows who will be attacked next, but snarls that sound like human words can be heard and all around are the footprints of a monster whose hunger cannot be sated. 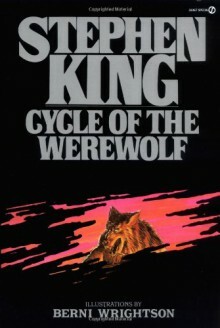 Cycle of the Werewolf is a very short and amazing story that won't take long to finish. It is perfect for those who don't have that much time available to read. I loved how it is broken up, separated by the month and the pictures are super cool and somewhat gruesome.